Extend the Life of Your Roof by Keeping it Dirt Free! 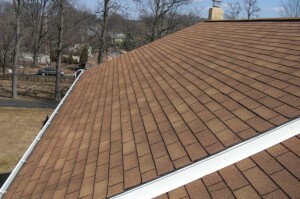 Do you have black vertical streaking on asphalt shingle roofing? If so this is caused by mold & mildew. In the early stages it is more of a cosmetic issue but as the mold / mildew ages & progresses and turns into moss, it becomes very destructive and shortens the life span of the roof shingle. Roofs are no different then the rest of your home they require frequent cleaning and being that this is a large area that is subject to outdoor elements it needs to become a priority. Many times people ignore cleaning their roofs and that leads to untidiness and formation of algae and other plantations, which are harmful to roofing materials. Cleaning the roof is vital just like other areas of your home and if you are seeking such assistance, then we at Lansdale Power Washers are here to assist you with best of our knowledge, skilled labor and latest equipment. We have a wide range of equipment like man lifts and environmentally safe chemicals for roof cleaning. Our team will inspect your entire roofing system and decide the type of washing pressure required, according to its condition. After analyzing all the details, like square foot area of your roof, time needed for cleaning, manpower and materials required, we will provide you an estimate. However, we make sure that our roof cleaning services are the most affordable in industry. With our hi-tech power washers, we are capable of removing the biggest enemy of today’s roofs ‘Fungus.’ It generally nurtures on nutrient and moisture, especially if the roof is surrounded by water bodies or trees. It worsens the roof quality and makes it look gruesome and old. We at Lansdale Power washers have a team of proficient pressure washers who use special tools to remove such plantation from the roof surfaces and give it that new look again. Our roof cleaning and washing services provide the best solutions against algae, fungus, moss, lichen etc. and all of these resolutions are simple, yet highly effective. Lansdale Power washers provide a low-pressure chemical wash that is effective in the removal of mildew, streaks/strains, algae, without damaging your roof. With ample effectual tools and our 55’ Man lift, we are skilled to clean any type of roof without walking on it and proficient to access all roof heights and pitches in a safe manner, as well. Roof cleaning is undoubtedly a risky task and requires professional assistance. At Power Washers, we use non-pressure washing process to clean the algae from the roof safely. Additionally, we also offer pressure washing services that is a wise and less deterrent program.